Storing unused, unwanted, or expired medicines can lead to accidental poisoning, drug abuse, and even drug trafficking. Unfortunately, when people dispose of their medicines, they often flush them down the toilet, not knowing that most wastewater treatment plants are not designed to safely remove medicine from water. As a result, these drugs end up contaminating our streams, rivers, and waterways. Drug take-back collection programs provide communities with a simple, safe, and effective way to dispose of their leftover medicines. The Drug Enforcement Administration’s (DEA) final rule on the collection and disposal of controlled substances, such as Oxycontin, Percocet, and Vicodin—released September 9, 2014—allows manufacturers, distributors, reverse distributors, narcotic treatment programs, retail pharmacies, and hospitals/clinics with an on-site pharmacy to voluntarily apply for authorization to maintain on-site drug collection receptacles and mail-back programs. In addition to following federal regulations regarding the disposal of controlled substances, states and municipalities also support programs for safe pharmaceutical disposal. While there is no standard method for designing and implementing a take-back program, all programs must comply with certain collection, handling, storage, transportation, and disposal guidelines. It is important to check with state regulatory agencies, state pharmacy boards, and local government agencies to see which policies are currently in place. From there, you can begin building your own program within the legal parameters of your local jurisdiction, while also complying with the DEA rule. On this page you will find a number of resources to help identify the best ways to develop partnerships, run messaging campaigns, and create a successful take-back initiative for your community. To learn more about PSI’s efforts to bring pharmaceutical take-backs to all communities, click here. Drug Enforcement Administration. (King County, WA). How-to Guide for Drug Take-Back: Managing a Pharmacy-Based Collection Program for Leftover Pharmaceuticals (September 2016). Lessons Learned: Voluntary Pharmaceutical Take-Back in the Great Lakes. (September 2013). Key Elements of Pharmaceutical Collection and Disposal Programs: A Vision for the Great Lakes Region. (October 2011). Prescription for Safety Program. (Covanta Energy). MedReturn Drug Collection Unit - Locations and Resources. Green Pharmacy Program. (Teleosis Institute). Unused and Expired Medicines Project. (Community Medical Foundation for Patient Safety). 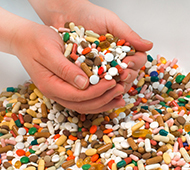 Safe Disposal of Unused Controlled Substances: Current Challenges and Opportunities for Reform. (Avalare Health, prepared for King Pharmaceuticals). Good Drugs Gone Bad. (Drug Abuse Prevention Coalition in Wisconsin). Video Series - How to Organize a Collection for Household Pharmaceutical Waste. Ed Gottlieb, Ithaca Area Wastewater Treatment Facility, New York. Medication Disposal Day Guidelines. Cardinal Health Foundation. Holding an Unwanted Medication Collection for Community Pharmacies: A Quick Guide. (November 2008). Northeast Recycling Council. How to Hold a Successful Unwanted Medicine Collection Event. (2009). Indiana-Illinois Sea Grant. Project Drug Drop. National Association of Drug Diversion Investigators (NADDI). CalRecycle. Criteria and Procedures for Model Home-Generated Pharmaceutical Waste Collection and Disposal Programs. Oregon Pharmaceutical Take-Back Stakeholder Group: Final Report. (2007). New York Department of Energy and Conservation. How to Hold a Pharmaceutical Collection. Washington Take Back Your Meds Coalition. Wisconsin Department of Natural Resources. Collecting Unwanted Household Pharmaceuticals. Drug Take-Back Programs in the Great Lakes States: A Closer Look. (September 2013).